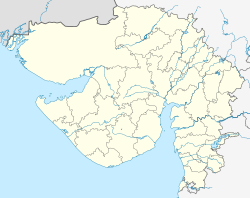 Gujarat (Gujarati: ગુજરાત, Sindhi: گوجارات‎) is a state within the Republic of India. Gandhinagar is the capital of Gujarat. This city is named after Mahatma Gandhi. Its area is 75,686 mi² (196,077 km²), excluding the Kori Creek of the Rann of Kachchh: which is disputed by Pakistan , but it includes the Kutch District, in terms of area it is bigger than Syria but smaller than Senegal. In traditional Indian geography it falls under the West Indian zone. Surat, Bharuch, Ahmedabad, Vapi, Badoda, Porbandar, Rajkot, Jamnagar are some important cities in Gujarat. Champaner, Gondal, Bhavnagar, Utelia, Zainabad, Bhuj, Sasangir are some tourist places. People in Gujarat are mainly engaged in Agriculture and business. The state is bordered by Rajasthan to the north, Maharashtra to the south, Madhya Pradesh to the east, and the Arabian Sea and the Pakistani province of Sindh to the west. Its capital city is Gandhinagar, while its largest city is Ahmedabad. Gujarat is native place to the Gujarati-speaking people of India. Wikimedia Commons has media related to Gujarat. This page was last changed on 7 April 2019, at 19:53.